This section covers the basics of problem components: what they look like to you and your learners, and the options that every problem component has. For more information about individual problem types, see Exercises and Tools. 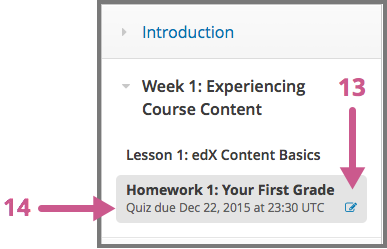 The problem component allows you to add interactive, automatically graded exercises to your course content. You can create many different types of problems in Studio. All problems receive a point score, but, by default, problems do not count toward a learner’s grade. To have problems to count toward the grade, change the assignment type of the subsection that contains the problems. For more information, see Set the Assignment Type and Due Date for a Subsection. All problems on the edX platform have several component parts. Check. The learner selects Check to submit a response or find out if his answer is correct. If the answer is correct, a green check mark appears. If it is incorrect, a red X appears. When a learner selects Check, the LMS saves the grade and current state of the problem. Save. The learner can select Save to save his current response without submitting it for a grade. This allows the learner to stop working on a problem and come back to it later. Show Answer. This button is optional. 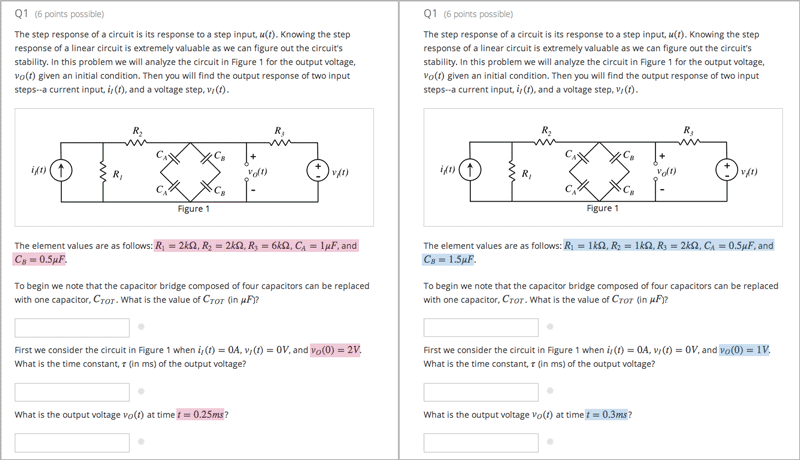 When the learner selects Show Answer, the learner sees both the correct answer (see 2 above) and the explanation (see 10 below). You define whether the Show Answer button is visible. Attempts. You can set a specific number of attempts or allow unlimited attempts for a problem. By default, the course-wide Maximum Attempts advanced setting is null, meaning that the maximum number of attempts for problems is unlimited. If the course-wide Maximum Attempts setting is changed to a specific number, the Maximum Attempts setting for individual problems defaults to that number, and cannot be set to unlimited. Feedback. After a learner selects Check, all problems return a green check mark or a red X.
Reset. Learners can select Reset to clear any input that has not yet been submitted, and try again to answer the question. If the number of Maximum Attempts that was set for this problem has been reached, Reset is not visible. Grading. You can specify whether a group of problems is graded. If a group of problems is graded, an icon of a pen and a piece of paper appears or that assignment in the course navigation pane. Due date. The date that the problem is due. A problem that is past due does not offer a Check option. It also does not accept answers or provide feedback. Problems can be open or closed. Closed problems do not have a Check option. Learners can still see questions, solutions, and revealed explanations, but they cannot check their work, submit responses, or change an earlier score. Accessible Label. In the problem text, you can identify the text that is, specifically, the question that learners need to answer. The text that is labeled as the question is used by screen readers, reports, and Insights. For more information, see The Simple Editor. Weight. Different problems in a particular problem set can be given different weights. All problems are written in XML. However, Studio offers two interfaces for editing problem components: the simple editor and the advanced editor. The simple editor allows you to edit problems visually, without having to work with XML. The advanced editor converts the problem to edX’s XML standard and allows you to edit that XML directly. You can switch at any time from the simple editor to the advanced editor by selecting Advanced Editor from the simple editor’s toolbar. However, after you save a problem in the advanced editor, you cannot open it again in the simple editor. When you select the following problem types, the simple editor opens with a preformatted example problem. Checkbox Problem: In checkbox problems, learners select one or more options from a list of possible answers. Dropdown Problem: In dropdown problems, learners select one answer from a dropdown list. Multiple Choice Problem: Multiple choice problems require learners to select one answer from a list of choices that appear below the problem text. Numerical Input Problem: Numerical input problems require answers that include only integers, fractions, and a few common constants and operators. Text Input Problem: In text input problems, learners enter a short text answer. The following image shows an example multiple choice problem in the simple editor. The simple editor includes a toolbar with options that provide the required formatting for different types of problems. When you select an option from the toolbar, formatted sample text appears in the simple editor. Alternatively, you can apply formatting to your own text by selecting the text and then one of the toolbar options. Descriptions of the toolbar options follow. Heading: Formats text as a title or heading. Multiple Choice: Identifies text as an answer option for a multiple choice problem. Checkboxes: Identifies text as an answer option for a checkboxes problem. Text Input: Identifies text as the correct answer for a text input problem. Numerical Input: Identifies the correct answer, with an optional tolerance, for a numerical input problem. Dropdown: Identifies a comma-separated list as correct and incorrect answer options for a dropdown problem. Explanation: Formats text as an explanation that appears after learners select Show Answer. Opens the problem in the advanced editor. Opens a list of formatting hints. Accessible Label: Identifies the part of the problem text that is the specific question that learners will answer by selecting the options that follow, or by entering a text or numeric response. The toolbar does not have an option that provides this formatting, so you type two angle brackets on either side of the question text pointing inward. For example, >>Is this the question text?<<. Screen readers read all of the text that you supply for the problem, and then repeat the text that you identify with this formatting immediately before reading the answer choices for the problem. The advanced editor opens a problem in XML. Templates for problems such as such as drag and drop and math expression input open directly in the advanced editor. The following image shows the multiple choice problem above in the advanced editor instead of the simple editor. The following problem templates open in the advanced editor. Circuit Schematic Builder Problem In circuit schematic problems, learners create and modify circuits on an interactive grid and submit computer- generated analyses of the circuits for grading. Drag and Drop Problem (Deprecated) Drag and drop problems require learners to drag text or objects to a specific location on an image. Image Mapped Input Problem Image mapped input problems require learners to select a specific location on an image. Math Expression Input Problems Math expression input problems require learners to enter a mathematical expression as text, such as e=m*c^2. Problem with Adaptive Hint These problems can give learners feedback or hints based on their responses. 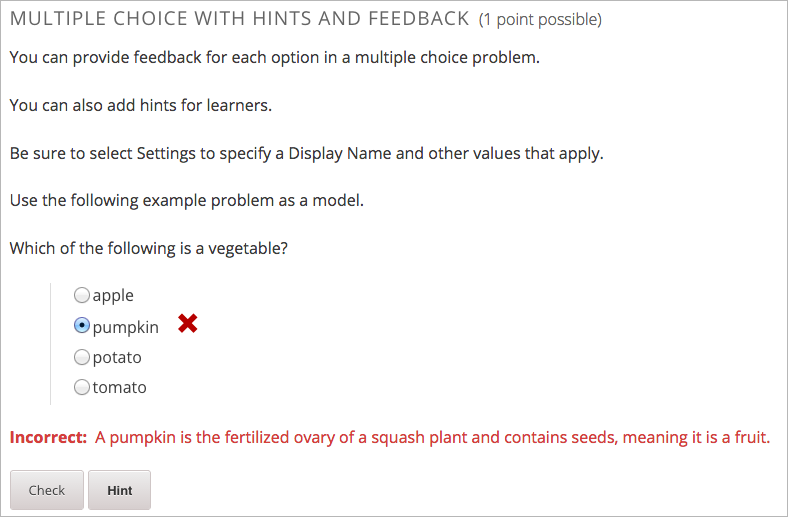 Problems with adaptive hints can be text input or multiple choice problems. Problem Written in LaTeX This problem type allows you to convert problems that you previously wrote in LaTeX into the edX format. Note that this problem type is a prototype, and is not supported. 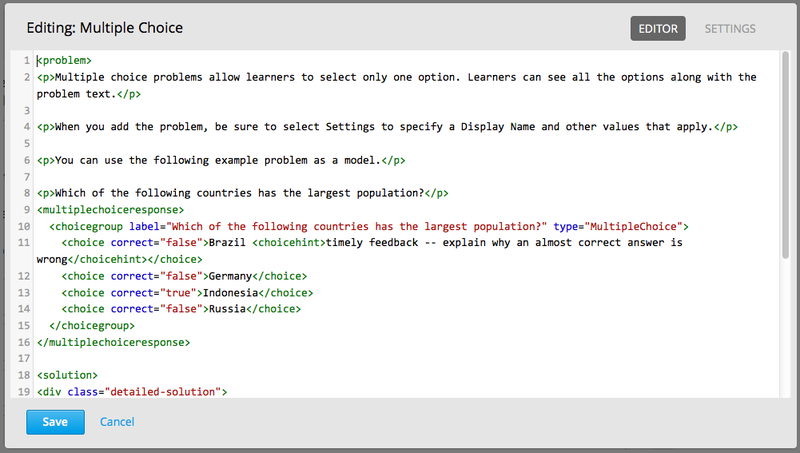 Write-Your-Own-Grader Problem Custom Python-evaluated input (also called “write-your-own-grader” problems evaluate learners’ responses using an embedded Python script that you create. These problems can be of any type. In addition to the text of the problem, problems that you create using a problem component have the following settings. To access these settings you select Settings in the component editor. This setting indicates the name of your problem. This name appears as a heading above the problem in the LMS, and it identifies the problem for you in Insights. Each problem type supplies a default display name that identifies the type of problem component added. Changing the default to a unique, descriptive display name can help you and your learners identify different problems quickly and accurately. If you delete the default display name and do not enter your own identifying name, the platform supplies “problem” for you. This setting specifies the number of times that a learner is allowed to attempt answering a problem. By default, the course-wide Maximum Attempts advanced setting is null, meaning that the maximum number of attempts for problems is unlimited. If the course-wide Maximum Attempts setting is changed to a specific number, the Maximum Attempts setting for individual problems defaults to that number, and cannot be set to unlimited. edX recommends setting Maximum Attempts to either unlimited or a very large number. Unlimited attempts allow for mastery learning and encourages risk taking and experimentation, both of which lead to improved learning outcomes. Allowing for unlimited attempts might be impossible in some courses, such as those where grading is primarily based on multiple choice problems. The LMS stores scores for all problems, but scores only count toward a learner’s final grade if they are in a subsection that is graded. This setting specifies the total number of points possible for the problem. The problem weight appears next to the problem’s display name. By default, each response field, or “answer space”, in a problem component is worth one point. Any problem component can have multiple response fields. For example, the problem component above contains one dropdown problem that has three separate questions, and also has three response fields. You can increase or decrease the weight for a problem component by entering a Problem Weight. A problem’s Weight setting is left blank. The problem has two response fields. 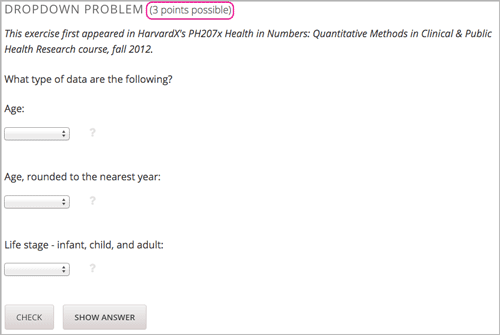 Because the problem has two response fields, the maximum score is 2.0 points. The Randomization setting serves a different purpose from “problem randomization”. The Randomization setting affects how numeric values are randomized within a single problem and requires the inclusion of a Python script. Problem randomization offers different problems or problem versions to different learners. For more information, see Problem Randomization. Always Learners see a different version of the problem each time they select Check. 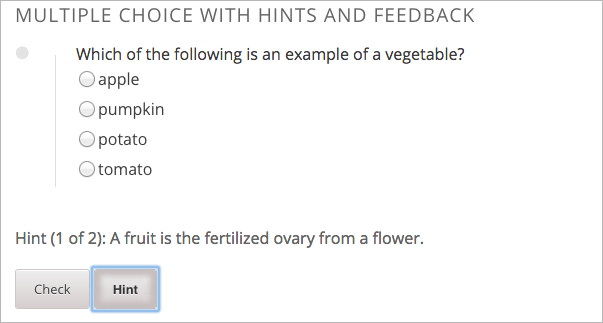 Always Always show the answer when the learner selects the Show Answer button. Show the answer after the learner tries to answer the problem. Closed Show the answer after the learner has used up all his attempts to answer the problem or the due date has passed. Finished Show the answer after the learner has answered the problem correctly, the learner has no attempts remaining, or the problem due date has passed. Correct or Past Due Show the answer after the learner has answered the problem correctly or the problem due date has passed. Past Due Show the answer after the due date for the problem has passed. Never Never show the answer. In this case, a Show Answer button does not appear next to the problem in Studio or in the LMS. This setting defines whether a Reset button is visible on the problem. If the number of Maximum Attempts that was set for this problem has been reached, the Reset button is not visible. This problem-level setting overrides the course-level Show Reset Button for Problems setting. 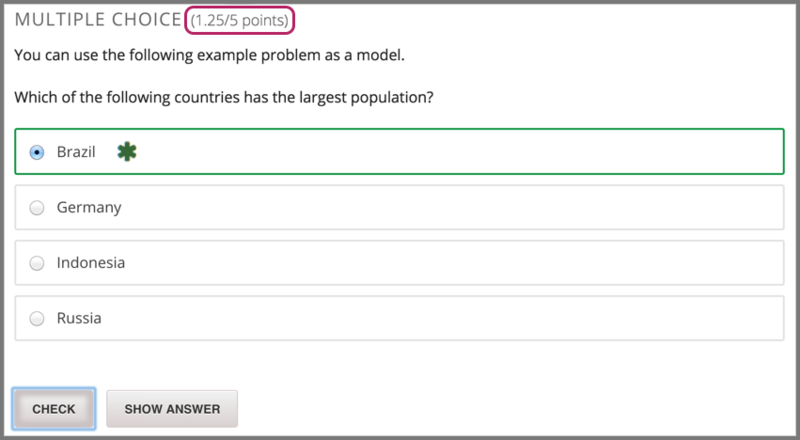 After a learner submits a response to a problem, the LMS stores that response, the score that the learner received, and the maximum score for the problem. For problems with a Maximum Attempts setting greater than one, the LMS updates these values each time the learner submits a new response to a problem. However, if you change a problem or its attributes, existing learner information for that problem is not automatically updated. In the problem component that you changed, increase the number of attempts for the problem, then ask all your learners to redo the problem. For information about how to review and adjust learner grades in the LMS, see Learner Grades and Grading. You might want to create a problem that has more than one response type. For example, you might want to create a numerical input problem and then include a multiple choice problem about that numerical input problem. Or, you might want a learner to be able to check the answers to many problems at one time. To do this, you can include multiple problems inside a single problem component. The problems can be different types. To create multiple problems in one component, create a new Blank Advanced problem component, and then add the XML for each problem in the component editor. You only need to include the XML for the problem and its answers. You do not have to include the code for other elements, such as the Check button. Elements such as the Check, Show Answer, and Reset buttons, as well as the settings that you select for the problem component, apply to all of the problems in that component. Thus, if you set the maximum number of attempts to 3, the learner has three attempts to answer the entire set of problems in the component as a whole rather than three attempts to answer each problem individually. If a learner selects Check, the LMS scores all of the problems in the component at once. 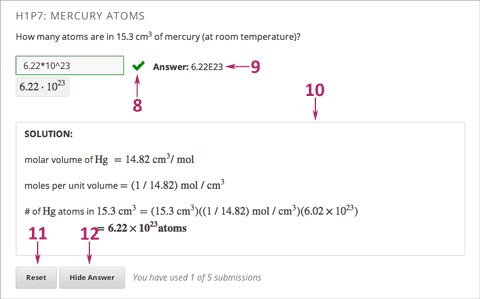 If a learner selects Show Answer, the answers for all the problems in the component appear. You can add feedback, hints, or both to the following problem types. You can add feedback that is displayed to learners when they submit an answer. For example, the following multiple choice problem provides feedback in response to the selected option when the learner selects Check. In this case, feedback is given for an incorrect answer. For example, in the following multiple choice problem, the learner selects Hint before attempting the answer. The hint indicates that it is the first of two hints. The learner selects Hint a second time. While editing a unit, in the Add New Component panel, select Problem. 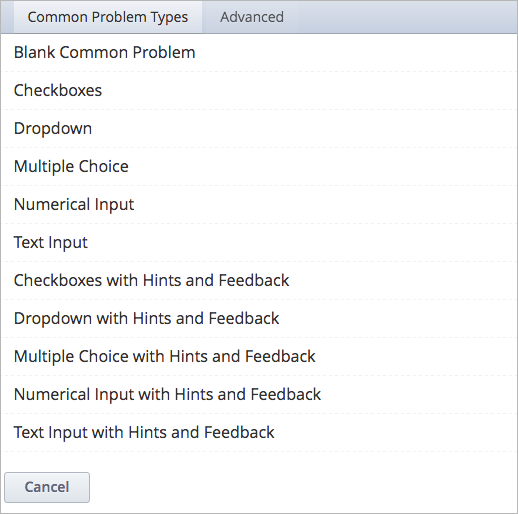 In the list that opens, select the Common Problem Types tab. Templates for problems with feedback and hints are listed. Problem randomization is different from the Randomization setting in Studio. Problem randomization offers different problems or problem versions to different learners, whereas the Randomization setting controls when a Python script randomizes the variables within a single problem. For more information about the Randomization setting, see Randomization. Sections, subsections, units, and components have different names in the Course Outline view and in the list of files that you will see after you export your course and open the .xml files for editing. The following table lists the names of these elements in the Course Outline view and in a list of files. For example, when you want to find a specific section in your course, look in the Chapter directory when you open the list of files that your course contains. To find a unit, look in the Vertical directory.